Hello all and Happy New Year! I’ve FINALLY got around to updating my website, and thought it was about time to make the most of this blogging area and share some of the things that have been going on in Paper Hawksville during 2018! So, to kick things off, I thought I’d share a bit of a ‘behind the screen’ (see what I did there? ), action with one of my favourite commissions of the year, the gorgeous boy that is Mo the Italian Greyhound! 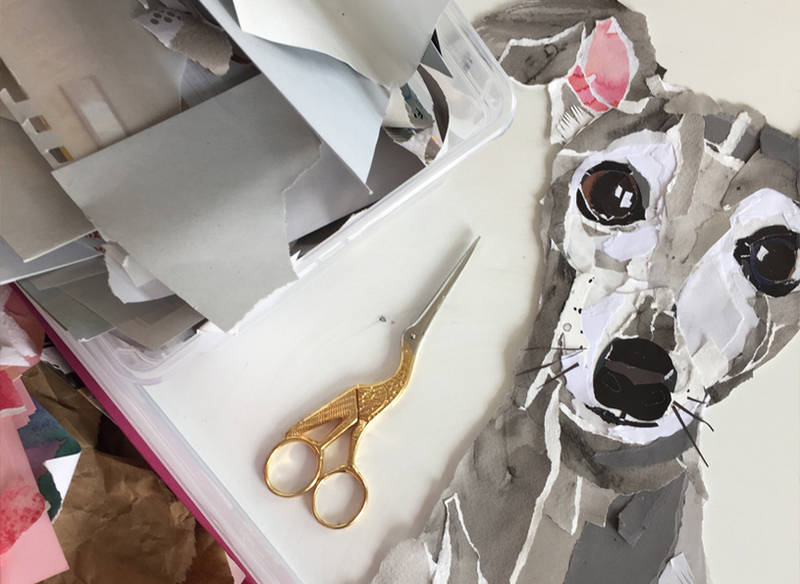 Mo’s lovely owner, Steff, got in touch after seeing a little portrait I did of my own beautiful boy (yes, I’m biased but, those eyes…), Walter the Border Terrier, and asked if I could do something similar with her fur-child, and I was more than happy to oblige! Dogs are so brilliant to illustrate as they have such character, so after a good scour over a few shots of Mo to get an idea of his personality, I got cracking! The finished illustration ended up at around A2 mounted, so (somewhat bizarrely!) bigger than actual Real Life Mo (shot of them together to follow). I loved every minute of making Paper Mo, and hopefully have captured a bit of his cheeky little character in the final portrait.